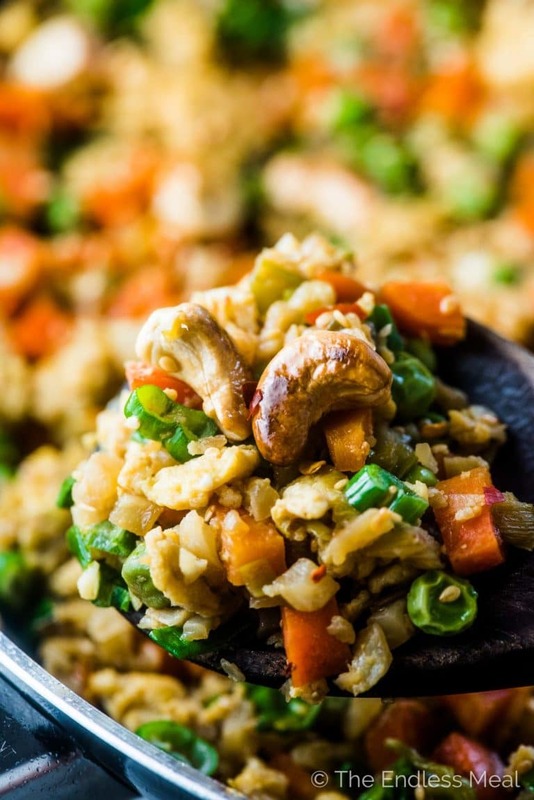 Paleo Cauliflower Fried Rice is INSANELY delicious. It's an easy to make and low carb option for when you're craving Chinese takeout. 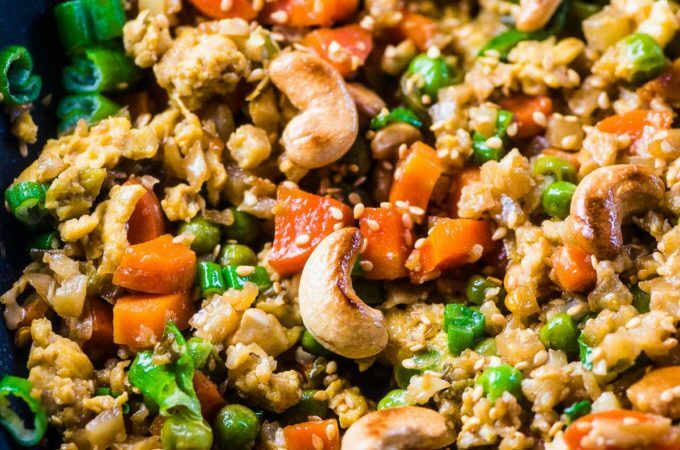 Made with cauliflower, eggs, your favorite veggies, garlic, ginger, cashews, and sesame seeds. Yum! What you're looking at here, my friends, is the best damn cauliflower fried rice. It's a big claim, I know. But it's 100% true. This recipe is meant to serve 4 people as a side dish, but it takes all my will power not to eat the entire batch all to myself. It's that good. Garlic, ginger, scallions, and sesame oil give it SO MUCH flavor. There is nothing bland or boring about this recipe. Crunchy toasted cashews. Big time in the flavor department AND the perfect bite. If you can't control yourself (no judgment!) and wind up eating the whole batch to yourself, you can still be happy knowing you're full of healthy vegetables and protein. 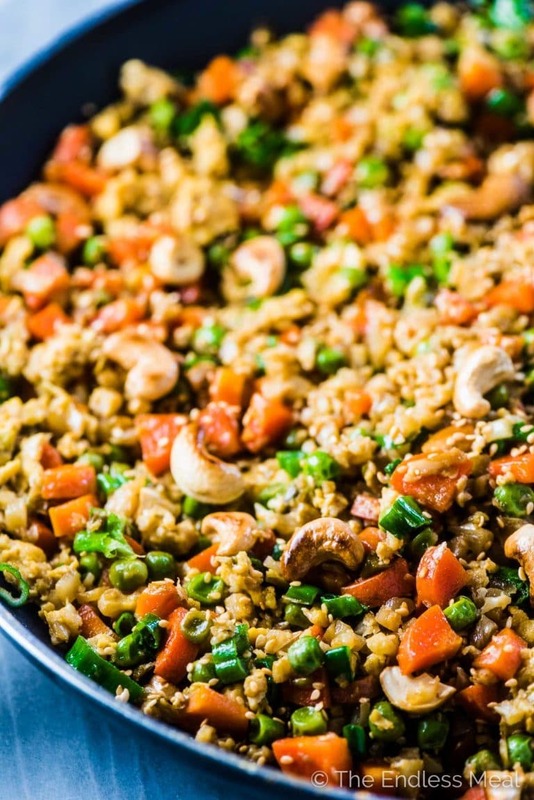 Low-carb, gluten-free, vegetarian, paleo fried rice that magically tastes better than any Chinese takeout I've ever tried. The perfect recipe for meal prep. 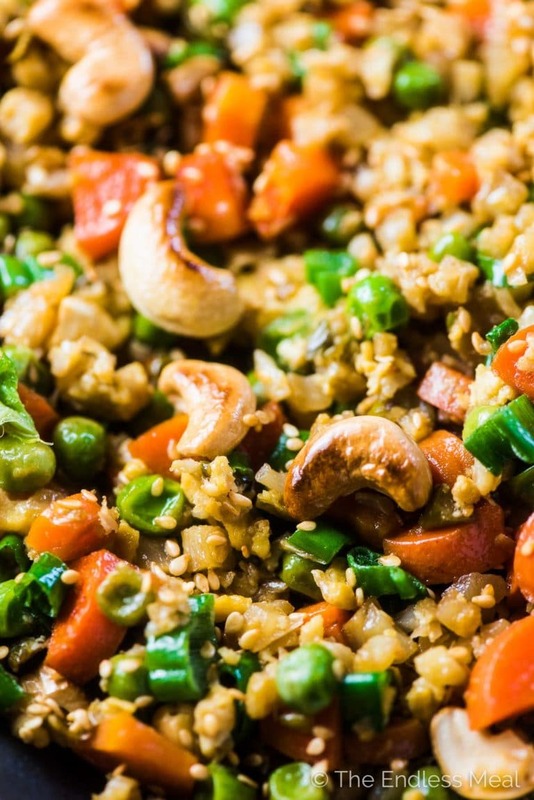 Seriously, this cauliflower fried rice is even delicious served cold for tomorrow's lunch. I've tested this enough times to know it's true! The first time I made this recipe was YEARS ago when I started learning about the paleo diet. I remember being amazed that cauliflower rice could taste so good. Honestly, it still does my head in. It's so similar to the real thing that even my handsome man, who generally will not eat veggie versions of rice and noodles, loves this recipe. That's how I know it's a real winner. Lucky for us, this recipe is super easy to make. Saute some garlic, ginger, and scallions. Then add your cauliflower rice, carrots, chili flakes, and coco aminos. ← If eating paleo isn't important to you, feel free to use soy sauce instead of coco aminos. Let the veggies soften then add some peas and sesame oil to the pan. Now all you have to do is push the rice to the sides of the pan, pour in some whisked eggs, and scramble them. 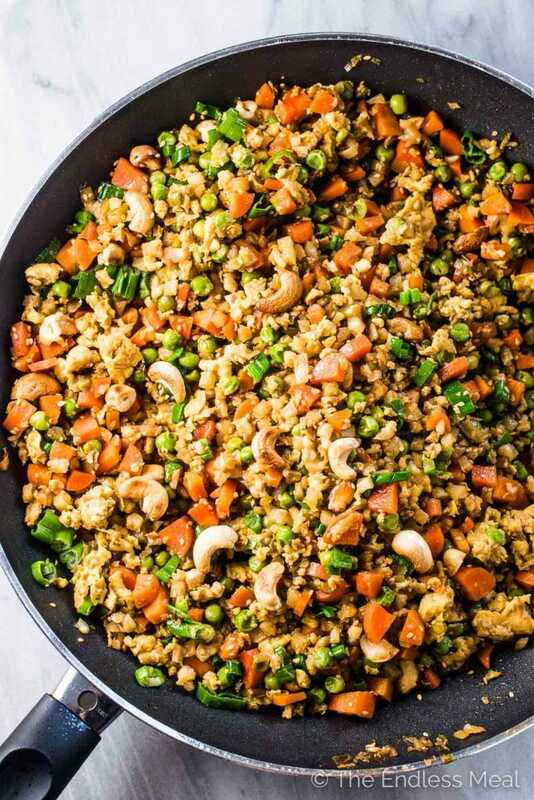 Mix the cauliflower fried rice with the scrambled eggs, the cashews, sesame seeds, and some green onions and dinner is ready! Buy it! This is by far the easiest. Most stores carry packages of cauliflower rice in the refrigerated section of the produce department. Use a grater. Take a head of cauliflower and use the large holes on a grater to grate it. Use a food processor. You'll need to work in a couple of batches and make sure not to process it too much or the texture will be too fine. Use a knife. When I don't buy cauliflower rice, I use my knife to make it as I find it's the easiest and least messy option. Separate the cauliflower into florets and mince them into rice-sized pieces. Either grate the cauliflower or pulse it in your food processor to make the cauliflower rice. Heat 2 teaspoons of the oil in a large, non-stick frying pan over medium-high heat. Add the light parts of the green onions, the garlic, and ginger. Let them cook for 2 minutes. Add the cauliflower rice, diced carrots, coco aminos or soy sauce, and chili flakes and cook for 5 minutes, stirring often. Add the peas and sesame oil to the pan and continue to cook until the vegetables are soft and the peas are warm. Push the vegetables to the sides of the pan and pour the remaining teaspoon of oil into the center and let it warm. Pour the eggs into the pan and scramble them. Once they are cooked stir them into the cauliflower rice. Stir in the remaining green onions, cashews, and sesame seeds. If you have raw cashews, roast them in your oven at 350 degrees for 7-8 minutes, or until they are golden and fragrant. Even though it is early in the morning, I would, by all means, eat this fabulous looking cauliflower fried rice right now. I love how easy and how healthy this recipe is. Thanks so much for sharing! Haha I love it! I’ve definitely eaten leftovers for breakfast before lol. It’s delicious! I made this the other day after you posted it to instagram and it was everything you said it would be. Even my young son loved it. Thank you for the recipe! I’m so happy to hear it was a hit with your family! I am in much need of gluten free options in my diet. Would love to change the way I eat but need some where to start. I’m moving toward a Paleo diet, but have yet to try cauliflower as a replacement for grains. Will have to try this! Love cauliflower rice! finding inventive ways to replace some not so great carbs/starches with veggies is something i’m looking to do after an indulgent holiday season (which somehow starts at the end of November now, what?). 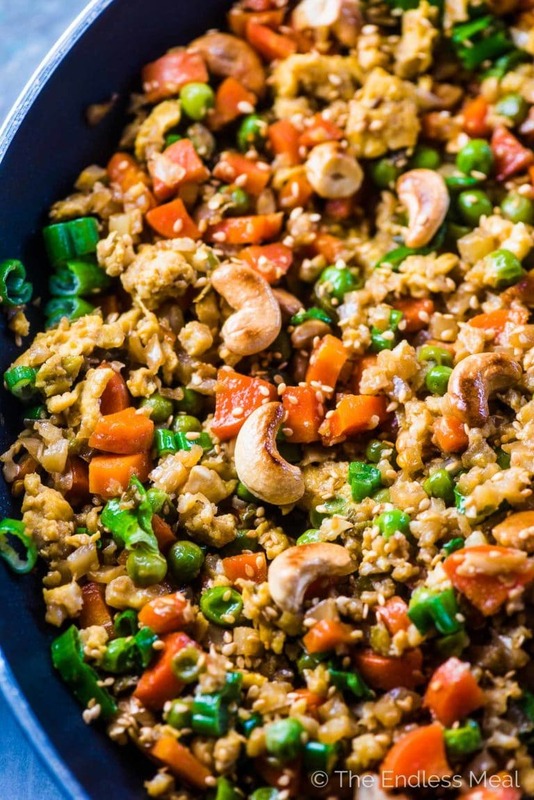 This cauliflower fried rice looks amazing! I definitely need to incorporate more healthy eating habits into my life right now. All those Christmas cookies and cocktails really did me in!